Gocek, known throughout Turkey for its fabulous yachts harbouring the rich and famous, now has its first truly glamorous bespoke villa. The house may be snuggled away in the peaceful rural mountainside but is just a short 15 minute walk to the bustle of Gocek itself. Villa Daidalos is a gorgeous, elegant home with handmade furniture and designer soft furnishings. The main living room has a spectacular gallery area with a high vaulted ceiling and a combination of large windows and French doors allow the whole house to be flooded with natural light. The fabulous 10 x 5 metre pool is surrounded by large sunny terraces with comfortable sunbeds and the gardens have many shrubs, flowers, vegetable and fruit trees including pomegranate, orange and avocado all to be enjoyed by our guests. There are also many outside dining and sitting areas plus a comfy hammock. The villa has many special features making it - we think - one of the best equipped holiday homes on the Turquoise coast. This is a beautifully equipped villa with many extras including hammock, huge outdoor turkish day bed, ipod dock, fast Wireless Internet connection, table tennis table, lots of games, books and use of a skippered motor boat. There are two main eating areas outside the property and one in a separate dining area in the main house. The apartment is equipped with its own kitchenette which is a perfect haven for teenagers, a nanny or extra guests. 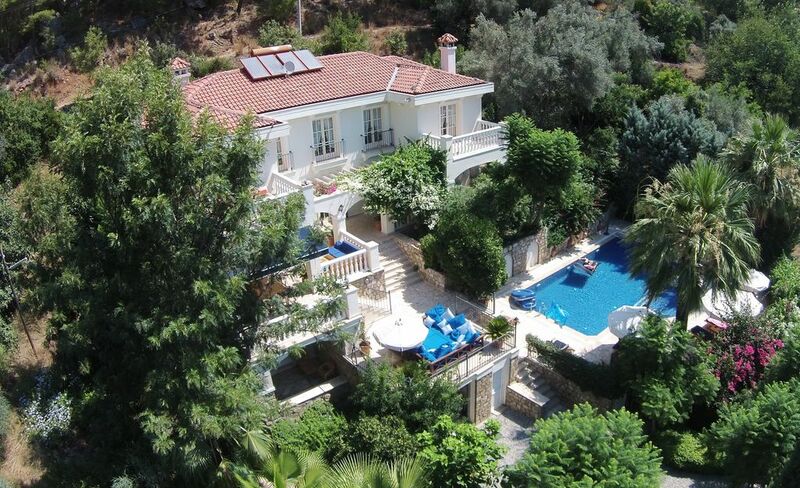 Within easy reach of Dalaman airport (20 mins) but tucked away in a rural hamlet in the hills. Luscious gardens (tumbling hibiscous, lime trees, pomegranate palms etc) with well laid out pool ideal for adults and kids. We loved the vibe of nearby Gocek town, great for laid back cocktails and waterside restaurants, with plentiful shops too. We would thoroughly recommend staying here, relaxed luxury which pleased young adults and their parents alike! We had the best holiday in this villa. The location makes it easy to access Gocek and visit other locations nearby. The villa itself is beautifully equipped and layed put. There is a generous welcome pack plus full cupboards of store cupboard food always lacking in other villas. A wonderful daily maid keeps the house clean and tidy and a care taker helps with advise and transfers. I can thoroughly recommend this villa. We stayed here for a week as a family. We had a lovely stay the villa had everything we needed and more! The staff were great, informative, helpful and diligent. The villa is in a great location and internally everything is to a very high standard. The gardens are and pool area is amazing. I doubt we will ever stay anywhere as nice again, we really have been spoilt forever. Thank you for having us stay. We have just returned from a weeks holiday at this stunningly beautiful villa. Nestled at the foot of a fantastic mountain. Surrounded by mature gardens and birdsong. We could not have asked for more. The charming maid came in each morning and very quietly tidied round and made the beds. Such a treat. One morning she made us a really special omelette for breakfast. The town was a 15-20 min stroll down quiet roads and what a treat the town is. Fabulous restaurants with the friendliest staff. Lovely bars that go out onto the water. Our first visit to Turkey but we will definitely go back. May is a lovely time of year as the flowers are all out and it the air is full of perfume. I would definitely recommend this villa. Gocek, just a 20 minute drive from Dalaman airport, is a very special place. The setting is so beautiful it has been designated a national park and is jealously protected by Turkish people. Nestling at the foot of the majestic pine covered mountains this lovely coastal village is largely car free with landscaped promenades and a host of exotic trees. Gocek is perfectly placed to visit the 12 islands lying off its shores; each tiny island has its own personality, some with ancient ruins to explore, others with sleepy restaurants but all set in breathtaking surroundings of warm crystal clear seas and secluded coves. including daily maid service to stay from November 2012 - May 2013 price on application.